The Bank of China Tower is one of the most recognizable skyscrapers in Hong Kong. 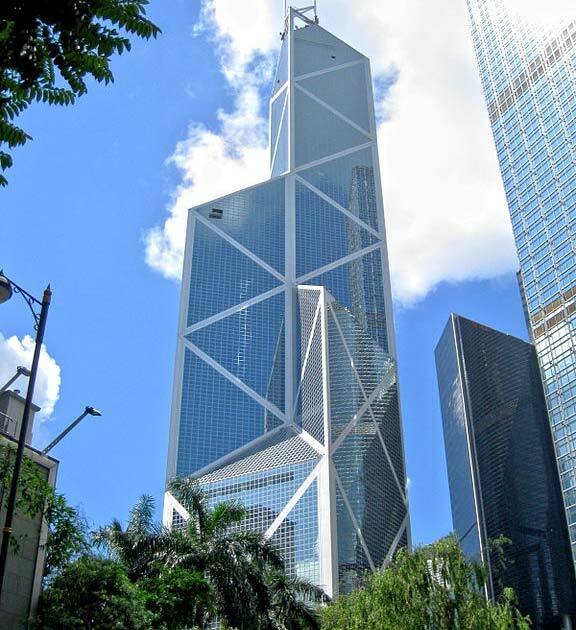 It houses the headquarters of the Bank of China-Hong Kong Limited. It is located at 1 Garden Road, in the Central and Western District of Hong Kong Island. The tower was designed by a renowned Chinese-American architect, I.M. Pei. It was constructed over a period of just over four years and completed for occupancy in August, 1989. It was officially opened in May, 1990, offering parking in four basement levels and a towering 70 floors. This tower structure is 1,033 feet tall and two masts give the building a total height of 1,205 feet. This made it the tallest building in Asia as well as fifth tallest in the world at the time of its completion. Even today it is still among the tallest buildings in Hong Kong. The structure consists of four triangular glass and aluminum towers. All are of different heights and they emerge from a beautiful granite podium. Another fascinating aspect about the tower is the geometric changes which can be seen throughout the structure. The sharp points and angles are interesting in contrast to other architecture in the city. The silver reflective glass used in the tower creates dancing points suitable for both sunny days and nights. Inside, the atrium is a soaring 14 stories tall. Visitors can take a quick elevator ride up to the 42nd floor which has a sky deck that provides a great view of downtown Hong Kong and beyond. The architect designed the Bank Tower of China to represent the desires and aspirations of the Chinese people as well as their good will towards the British colony. I.M. Pei changed the original “X” shapes in the plan since X is a symbol of death in China. Instead, he opted to use less threatening diamond forms. It was designed like a bamboo plant representing the growth pattern of the plant. This is a symbol of hope and regeneration in the Chinese culture. The structural steel work is expressed externally by the natural anodized panels which form a part of the curtain wall. The Bank of China Tower was the tallest building outside of America until the completion of Central Plaza in 1992. It is one of the eighteen buildings involved in Hong Kong’s Tourism Commission. The Bank of China Tower is good place to visit while in Hong Kong. If you are planning to visit Hong Kong make a point of visiting this tower. It will make your vacation even more enjoyable and memorable.